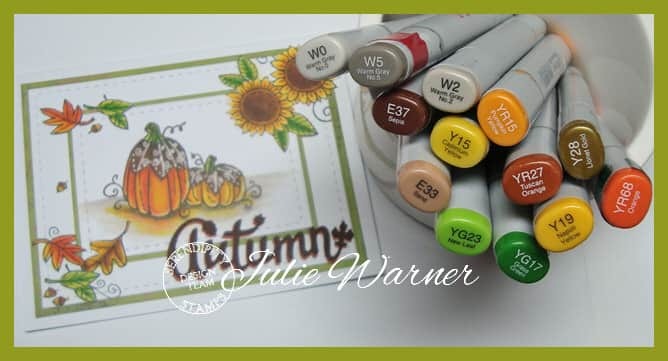 Today’s Color Challenge (CC598) is perfect for a fall card…cajun orange, curry yellow, chocolate & garden green. The dessert is to make a fall themed project. 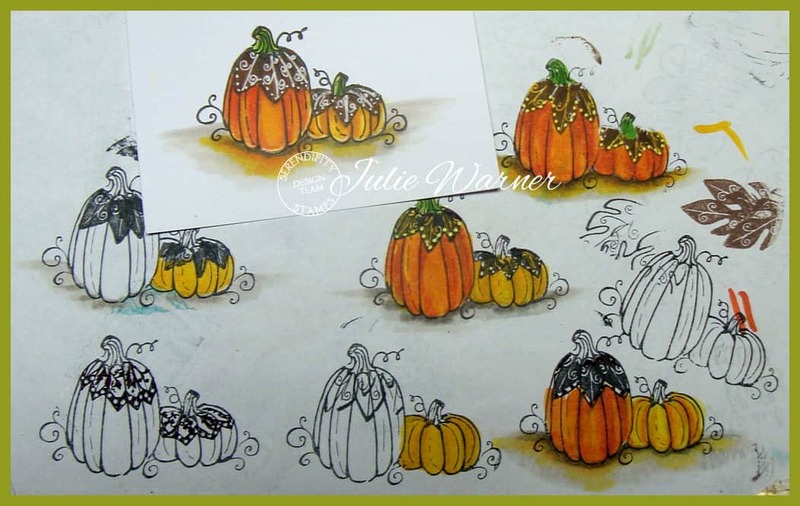 For my autumn/Thanksgiving themed card, I started w/ the cute little pumpkins. 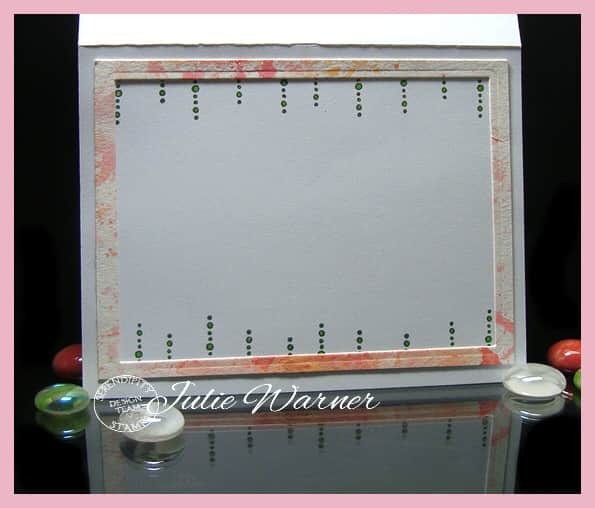 Yeah, I know just stamping & coloring would be the normal way to go. Sigh…but I remembered seeing some pumpkins w/ another image on top & that stuck in my head. Once stuck, it’s there until I try it. So just in case you’re interested, here’s my practice sheet. I practice on copy paper all the time & usually save these for masks later on. 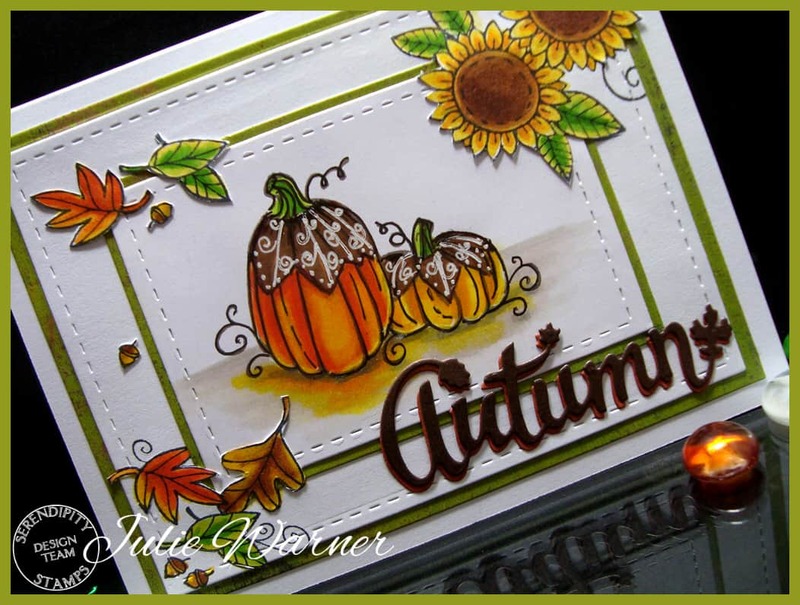 I did some doodling, masking, etc, but finally decided on masking the bottom & stamping the solid leaf (on the mid right) w/ brown ink on top of the pumpkin. After coloring a few to see how they’d look, I noticed that since it was copy paper, some of the color bled out when I added the shadow underneath & I liked it! It kind of looked like a reflection so I also tried to recreate that on the “good” version (upper left, above the watermark). The brown stamped leaf on the top of the pumpkin didn’t work out so well, so I went over it w/ a white gel pen & added the dots. 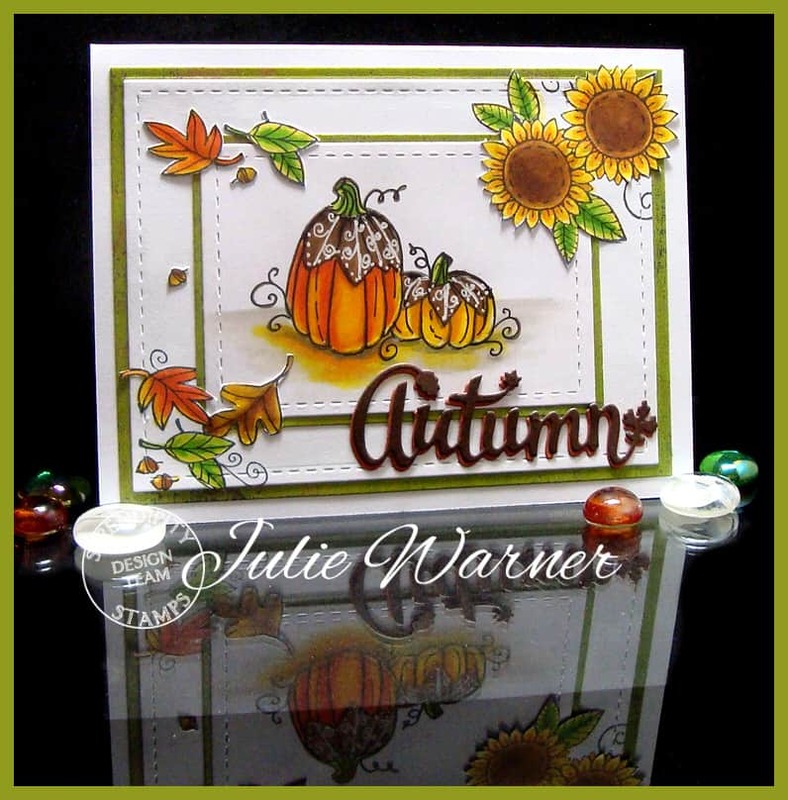 For the background, I stamped the sunflowers in the upper corner & the leaves in the lower left. I had to do a little out of the box to keep them intact. And while I was at it, I also cut around the parts that went into the main image so I could lift them on top. 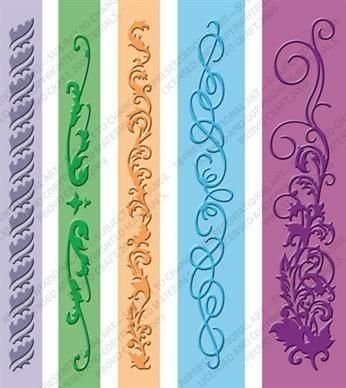 Sigh…I know it would be simpler to just do them separately & glue on top. But apparently I like to choose the road less traveled. Or the one that needs a machete to get through, lol. 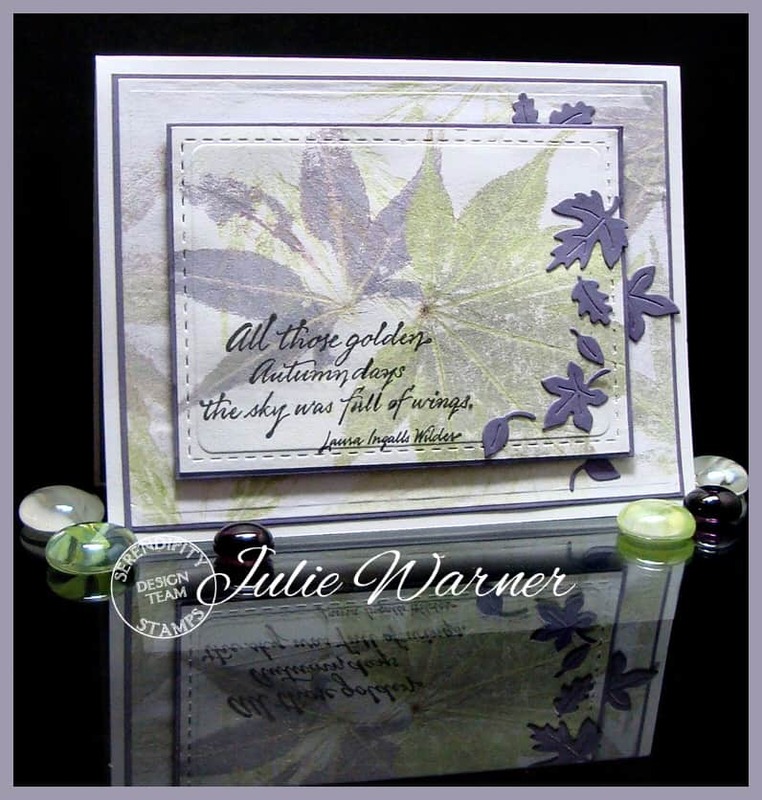 I made this for today’s Technique Challenge (TLC601) hosted by my sweet friend, Karen, over on Splitcoast. The challenge was to take something from the yard and make an impression of it to use on your project. So….what I learned from trying to run various leaves/flowers thru my Big Shot..
1. English Ivy leaves do not work. At all. 2. Geranium leaves really don’t work much better. 3. Sweet potato vine leaves work too well. They make a mess. 4. Geranium petals work, but they also make a mess & they do not want to release from the paper. 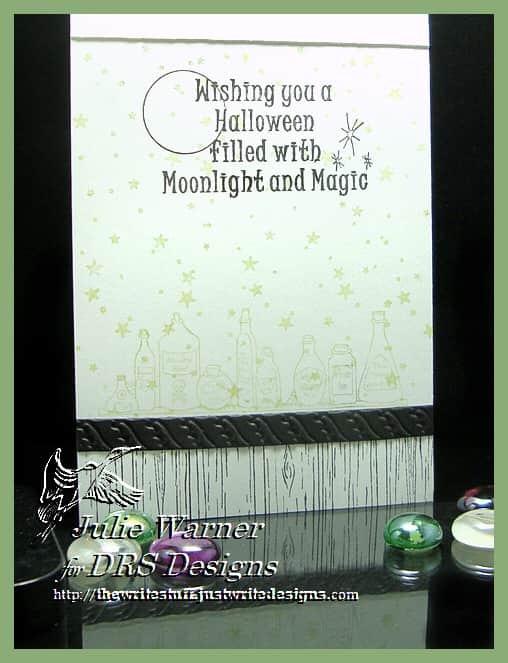 For my card, I used the 110# white c/s impression for the top layer & the larger one done on plain ol’ 24# copy paper. I even found a few Japanese maple leaves that had turned red! Since it has not been cool, I’ll assume it’s from heat stroke. 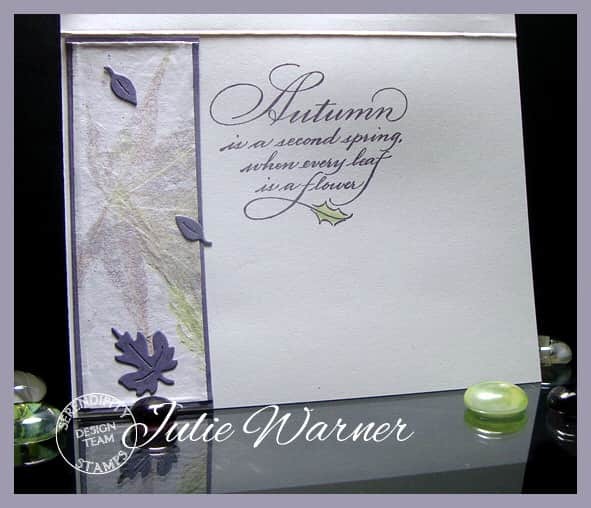 Added a couple of dusty purple layers & a few die cut purple leaves (to cover an unfortunate embossing incident w/ the stitched die), & a greeting. And here are the side by side comparisons. 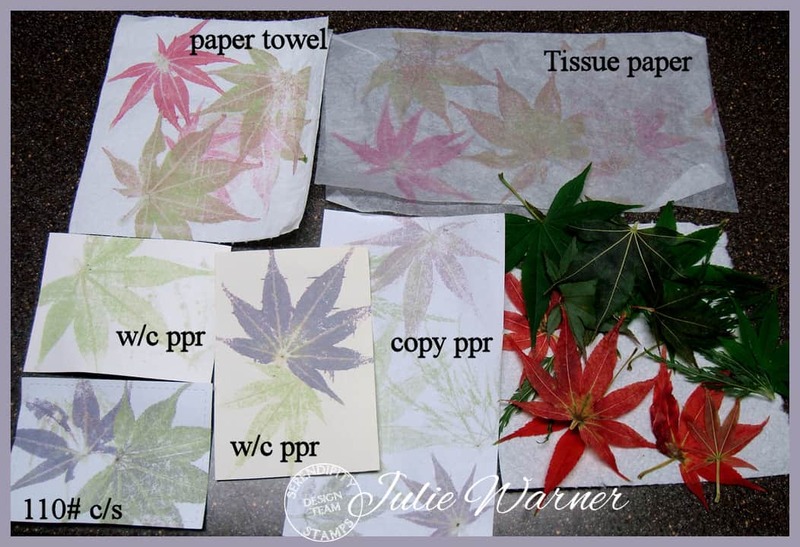 I’m definitely going to be using the paper towel versions in the future…love how they kept the reds of the leaves. The leaves on the right are the ones I used for all of these samples above. Only the paper towel & the tissue paper pressings retained the red color. On all the others, the red turned to shades of purple. 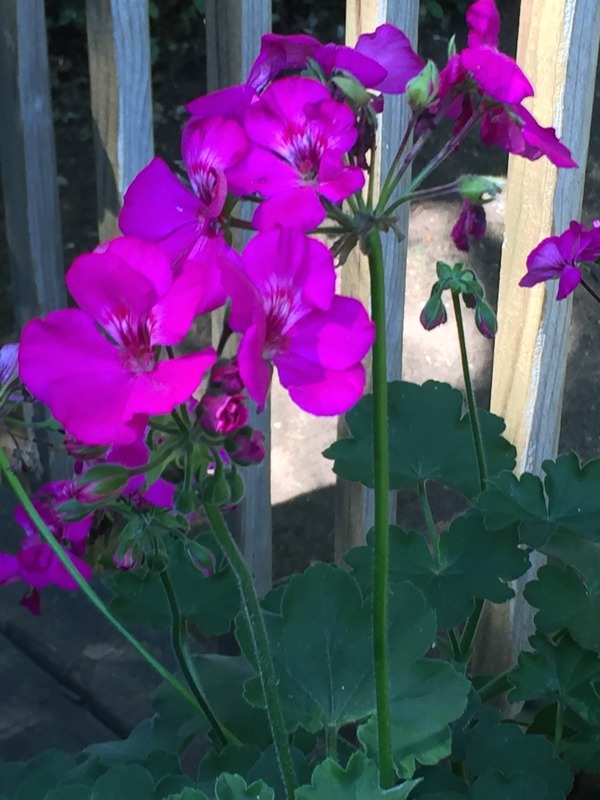 On the first one, the geranium petals did NOT want to let loose of the paper (the original color is a bright fuchsia..see pic below).The second one, they came off a little better, but I had to really scrub. 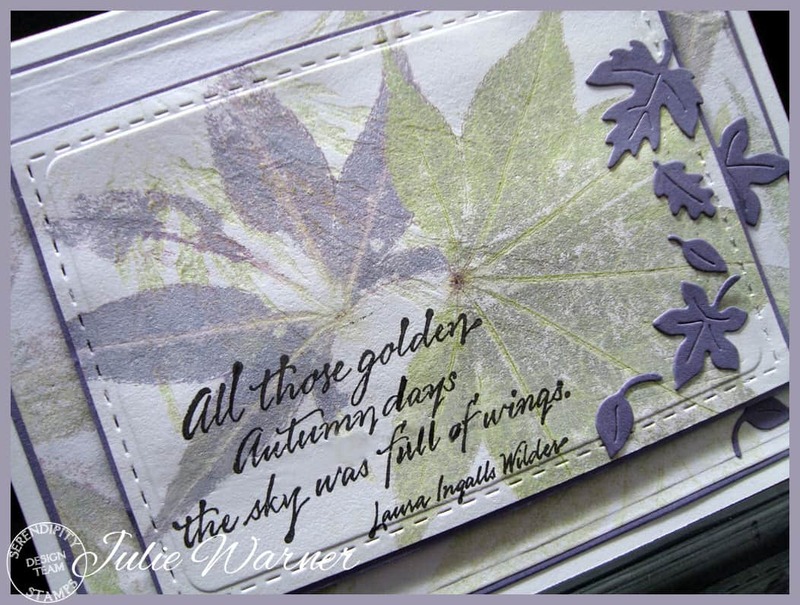 The maple leaves on plain white c/s came off easily, but the bright red leaves turned purple. 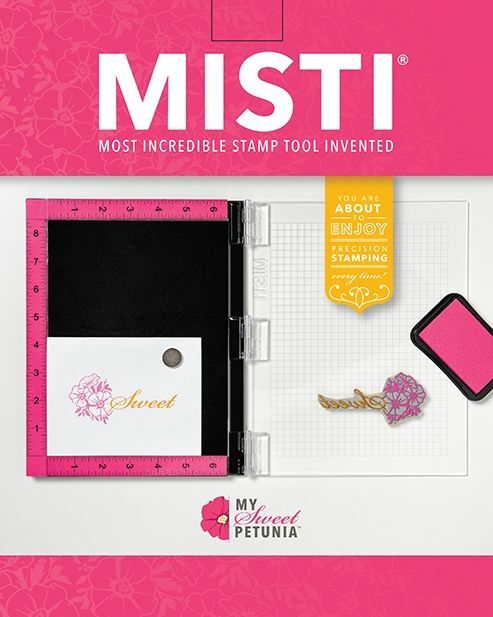 It’s my turn to host the Featured Stamper Challenge (FS499) on Splitcoast so a big congrats is in order to Mary, my choice for Featured Stamper! I chose THIS card to case. 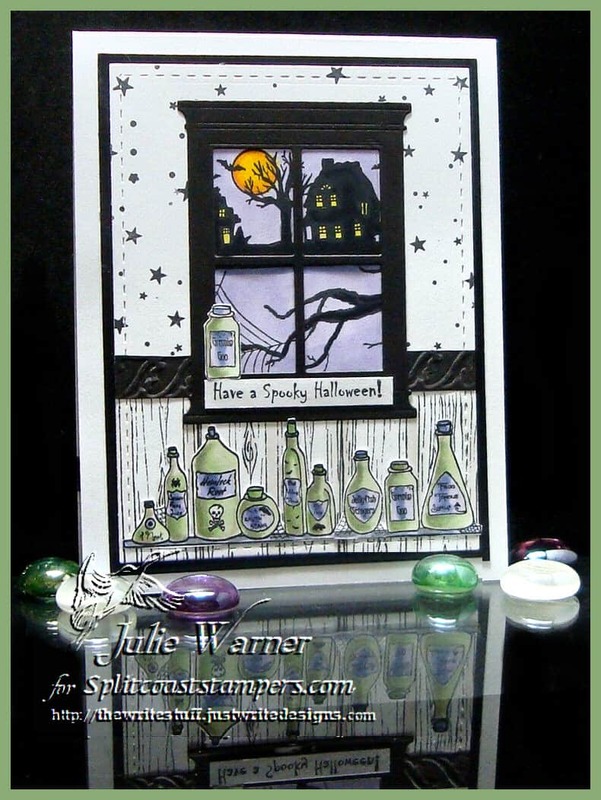 I kept the Halloween theme & fun window, but I used different images, different colors & put a scene outside my window instead of a pumpkin. After die cutting the white background, I masked off the upper section & stamped the woodgrain across the bottom, reversed the mask & stamped the stars across the top. I added a little embossed black strip to act as a chair rail, then added the fussy cut potions across the bottom. 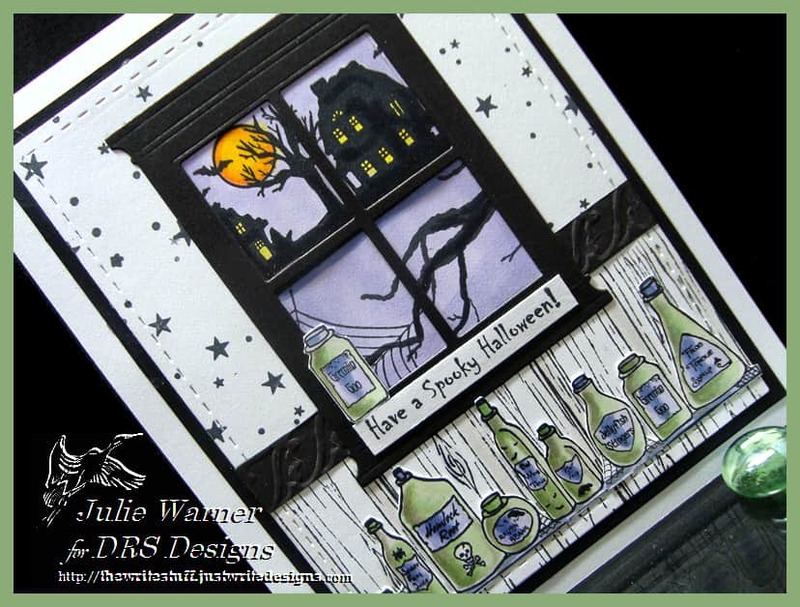 The window frame was die cut out of black & I stamped part of the branch, spooky house & spider web onto a piece of white just big enough to fit behind the window frame. 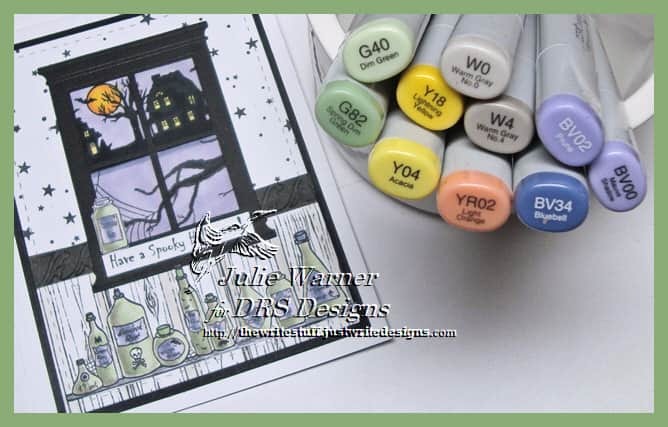 Here’s a look at the inside & below it are the Copics I used to color the potions & scene inside the window.